More detailed photographs from Jay for model builders on Picasa. I've put them there because it's easy to upload full-size photos and let Picasa make the thumbnails. I'll update the pages for N360SH after I get this note off to you. I'm copying this to Jay Womack. public domain already (e.g., something from the FAA or the NTSB), I will occasionally copy or link to that information. Jay sent me the photos and the story about his plane in 2005. I don't know whether his address is still valid. I'm also copying this to Brian Beaudry, who studied the Ultimate design very carefully and who helped Rob Holland rig his plane. Brian and Rob are at the top of their game and may be able to help answer your questions. Kendal's Home Page--with videos of him flying his Ultimate & lots of photos. 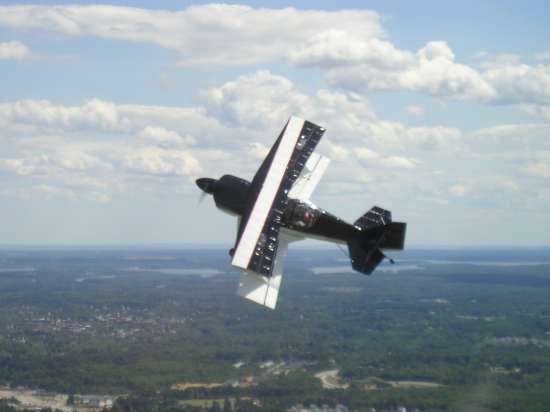 He has sold his Ultimate and is finishing a Pitts Model 12. Just wanted to let you know that I bought an Ultimate 10-200 and have been loving it. 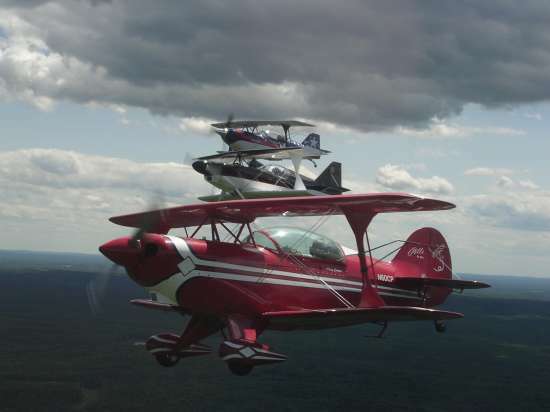 I had 10 hours on the airplane when I flew it to Maytown PA to compete in the Pennsylvania aerobatic championship. I moved up to Intermediate and wound up taking 2nd place. We only flew one flight before the rest of the competition was canceled due to weather but it was fun anyway. So far I've found that the Ultimate is a very straightforward acro mount. It is the easiest airplane to snap and hammer-head that I've ever flown. The snaps are crisp and fast. In the hammerhead with all that aileron in the prop blast there is more than enough to counter the torque so you just feed in the aileron untill you're hanging there, and then bam! you kick that big rudder and round she goes with no tendancy to torque under or anything. It also loves knife edge flight, it just seems very happy there. Vertical rolls and torque rolls are also a blast--it will really wind up fast rolling backwards. ... Keep up the good work on your site. Rob and I met Kendal at some of the contests. 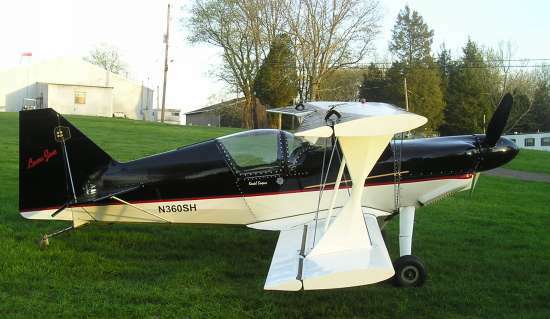 He was looking for a new airplane, so I put him in touch with Larry Baldwin, who was selling his 10-230 which he built. I spent some time talking to Larry, as he knew Gordon from being an Air Canada pilot, and spending time at Guelph airpark. Larry purchased his kit from Gordon's company. He also observed much of the development & flying of the 10-300S. He was great to talk to, because he allowed me to cross-reference info, and determine fact from opinion in many of the people I spoke with. Kendal is having a blast with his 10-230. Rob flew it, and said that the airplane is outstanding. He said it's the best snap-rolling airplane he's ever flown. The roll-rate is at least 400deg/sec. The hammerheads are spectacular. Also very easy to land. I asked Rob how the airplane maitained its energy when loaded up. He reported that it did very well. This was a negative comment from many people I talked to. The only explanation I can think of is that those people observed Gordon flying the 10-100, which was very under-powered. Gordon basicly had to start his sequence high, and work his way down. Just a guess though. Just wanted to let you know that Rob has a website up with some great video and pics of his 20-300. The web addy is www.Ultimateairshows.com My 10-200 has been down for a while ... but should see the air again sometime soon. :) ... Just wanted to give you the updates. Hope all is going well.